In an effort to take a stroll through a variety of literature, today I am going to talk a little bit about poetry. Let me first say that I am not always a fan. If is doesn't rhyme or have a hit you over the head rhythm, I usually can't find my way to the work. This time of the year a lot of the more seasonal poems find their way into my life: How the Grinch Stole Christmas and Twas the Night Before Christmas. These are poems I can read loud and proud. It is the free verse that leaves me wanting, at times. My first introduction to Jack Prelutsky was through his book My Parents Think I'm Sleeping, that encourages children to sneak read. The book caused him a bit of controversy. The book revealed the man's true soul to me and I was an immediate fan. As I looked further into his writing, I came across his poetry collections illustrated by Arnold Lobel, of my beloved Frog and Toad. I was hooked. 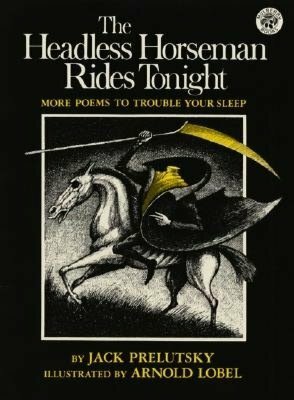 The collection, The Headless Horseman Rides Tonight, might be better introduced around Halloween, but the kids in my book clubs like horror anytime of the year. The poems do rhyme and the rhythm is obvious, so the poems are fun to share aloud. I would recommend a pre-read for your best performance. If your reader likes these poems, Prelutsky has many more collections available. Happy Reading!